This past year, a member of the Garfield Community was forced to move his family to a new home because of death threats connected to protests he was a part of. It started a little over one year ago, when the Garfield High School Football team was under the lense of national press after kneeling before their football game against West Seattle on September 16th, 2016. Now, over 100 NFL players have made similar gestures of protest. What connects many of the protesters, especially those who are people of color, is the threat of violence imposed on them by supposed sports supporters. This movement originated when Colin Kaepernick first sat and then kneeled during the national anthem. Kaepernick protested how this national tradition supports modern day racism which in turn perpetuates police brutality and other racialized violences. This all originates in part from this country being built on slavery. The Garfield Football team was inspired by Kaepernick’s protests and after a team wide discussion, they decided to first kneel in early September of 2016. Senior captain Mekhi Metcalf was a member of the 2016 team that decided to kneel. He remembers the willingness of the entire team to participate in this protest. “The whole team wanted to do it, Coach Thomas said that if you don’t feel that we need any changes to be made then you don’t have to do this. Everyone was all in and wanted to do it” said Metcalf. Many on the team have had personal experiences with police brutality or discrimination which fueled their act of protest. 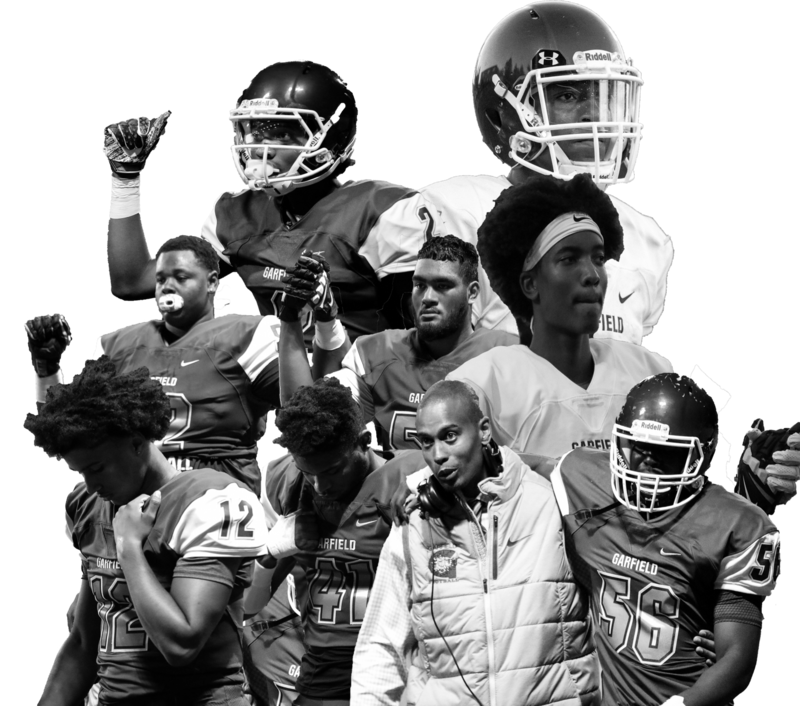 Although the original act of protest by the Garfield football team drew widespread support from other teams and youth in the school, the football team was soon met with hate speech and death threats nation wide. Head Coach Joey Thomas tried to protect his players by advising they stay off social media in the weeks following. Despite the coach’s caution, the team faced a brutal wake up call when Coach Thomas’ tires were slashed. “When we found out about that we realized we kind of had to be careful of who we were around” said Metcalf. On numerous occasions, Coach Thomas came face to face with the public’s dangerous reaction to these protests. Eventually he took drastic steps to ensure his family’s well being. “I moved from one residence to another. I took my kid out of the school he was in and put him in a different one so for me it was in some ways life changing” said Thomas. After the violent and threatening reactions the football team endured this past season, they decided to continue protesting but to adjust their strategies for the sake of safety. The football team decided to show a united front against inequality by linking arms with the other teams during the national anthem. The first two games went smoothly, however in the third game they were met with a different reaction. “Hale didn’t want to link arms with us. Their coach gave us a half hearted excuse.” said Thomas. Not only did Garfield football kneeling inspire members of the Garfield community, like the women’s volleyball and soccer teams who kneeled in 2016, but it also reached a national audience. “I think you could even say it helped inspire NFL athletes this year to stage their own mass revolts.” said Garfield teacher and activist Jesse Hagopian. “We should remember that high school students were doing this en masse before NFL players were and I think the mass action of the GHS school players in an important way made it possible for the NFL players to step forward and say were part of a growing movement.” said Hagopian. Although originally NFL players such as Michael Bennett, Eric Reid, Jeremy Lane and Brandon Marshall joined in Kaepernick’s protests, it wasn’t until Kaepernick came under fire from President Trump that the popularity of the protest skyrocketed. The following weekend, outraged NFL players and owners protested en masse. Lesean McCoy of the Buffalo Bills continued to stretch during the national anthem and the Seahawks, Titans and Steelers remained in their locker rooms during the national anthem. A notable difference after Trump’s comments was the new actions of NFL owners who joined in these protests. Both the Cowboys owner Jerry Jones and Washington’s owner Daniel Snyder linked arms and protested alongside their players. Many were quick to describe the widespread actions of the NFL as a moment of unity and expression of solidarity. However it begs the question; has the message of the protest changed? “ I do think that the original message is being papered over and that it’s important to come back to the fact that these protests need to be about making black lives matter and need to be about reducing disparities in the criminal justice system, they need to be about making sure that we really do have equality and justice for all and not just about protesting Trump’s comments.” said Hagopian. Many of the statements released by teams describing why they protested failed to mention the original message; police brutality and other manifestations of racism in America. After the mass protests in the NFL, the focus of the protests shifted from police brutality to protesting the rhetoric of the president. However, many of those who participated in the protests have actually donated to the Trump campaign. Jerry Jones, the owner of the Cowboys not only donated millions of dollars to the Trump campaign, but also released a statement over the past season saying that anyone who protests during the national anthem is disappointing. He then kneeled with his team when the optics were good for it, instead of supporting the fundamental rights of players speaking out about injustices in the world from the get go. Another example of an NFL owner exploiting the protests for the sake of good press is Washington Redskins owner Daniel Snyder. Snyder donated 1 million dollars to Trump’s inauguration and despite backlash that escalated to a supreme court case, has failed to change the blatantly offensive name of his team. “The name of his team is a racial slur against Native Americans so he clearly isn’t on the side of the movement for justice” said Hagopian. The action that le d to these two white NFL owners receiving praise is the same action that brought death threats to high school football players, forced Coach Thomas to relocate his family, and caused two high school players in Texas to be kicked off their football team. Not only are these owners failing to recognize the true message behind the protest, but they are also capitalizing on the movement in order to improve their image. Those who contributed to the movement early on were faced with hate speech, death threats and intimidation. However as soon as white, wealthy men joined the protest they were supported and praised by many. Sports have always been a vessel for protest because the actions of famous athletes reach a wide audience. This platform is a unique way for players across the world to have their voices heard, but more importantly raise awareness on issues. These protests are not new in the athletic community. On October 16, 1968, Olympians John Carlos and Tommie Smith raised their fist during the national anthem after receiving their medals, in a gesture supportive of the black power movement Smith and Carlos were immediately kicked out of the Olympic village, kicked off the national team and received countless death threats. This is a cycle in which many people of color in the world of sports and beyond are trapped. They protest violence, such as racial inequalities, and in turn are faced with further violence, intimidation, and threats. We are in a pivotal time in our history as a new phase of protests are unfolding before our very eyes. It is essential that we recognize the message of Kaepernick’s original protest and see clearly the discrepancies between those trying to capitalize on the popularity of the movement and those fighting for something bigger than themselves. We need to educate ourselves on not only the inequalities in our society that fuel these protests but on how we can take action to support those who are putting their lives and jobs on the line in order to call out these inequalities.